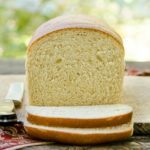 Buttermilk Wheat Bread is a fantastic sandwich bread with a touch of honey and lightness from white whole wheat. It's wonderful toasted too. Grease a large bowl and set aside. Place yeast in the bowl of a stand mixer. Heat 1 tablespoon honey and water in a small saucepan until warm (105°F to 110°F). Add to yeast, stir, and let stand for 5 minutes. Whisk together buttermilk, vegetable oil, remaining 2 tablespoons honey, and egg. Add to yeast mixture and stir well. Add wheat flour, salt, and baking powder. Using the flat beater, mix on low speed until moistened. Increase speed to medium and mix for 2 minutes. Change flat beater to dough hook. Turn mixer on low (setting 1 or 2 or as recommended by manufacturer when using dough hook). Gradually add enough bread flour to make a soft dough. Knead for 4 to 5 minutes. Turn dough out on a lightly floured surface. Knead a few times and shape into a ball. Place the dough in the greased bowl and turn to coat dough. Cover and let rise in a warm draft-free place until double, about 1 hour. While the dough is rising, grease two loaf pans (9- X 5- or 8- X 4-inch). Roll or pat each half to a 14- X 7-inch rectangle. Start with the shorter side and roll up tightly while pressing dough into roll with each turn. Pinch edge and ends to seal. Place rolled dough in bread pans. Cover with a tea towel and let rise until double, about 45 minutes. Pre-heat oven to 350°F while bread is on the second rise. Bake loaves for 25 minutes, or until loaves sound hollow when tapped. Rotate loaves half way through baking for even browning. Remove loaves from pans and cool completely on a wire rack. Nutrition facts are for each loaf.